Ora Rosenfeld Canter, D.D.S (Astoria) - Book Appointment Online! 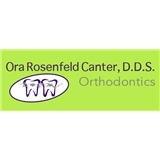 Welcome to the orthodontic practice of Dr. Ora Rosenfeld Canter. At our Astoria, Queens office we provide comprehensive orthodontic dental care for both children and adults. Dr. Canter is proud to provide the patients of Astoria and its surrounding environs with straighter teeth and beautiful smiles. At our office, your orthodontic health is our top priority, compassion is our trademark and a perfect smile is our ultimate goal. We promise to provide you with exceptional care every step of the way. Paying attention to each patient's specific needs and preferences is just part of what distinguishes our practice. It is our goal to make your course of treatment with us an extremely pleasant one and to give you a smile that is both beautiful and functional. At our practice, you will receive the highest quality orthodontic treatment with the utmost attention to detail. Excellent, knowledgeable. Happy to find this doctor in the area.